Any analysis of this game is largely academic as it became a case of Attack vs Defence after the first quarter of an hour once Chico had been sent off. Both offences in isolation are yellow card fouls, but usually the ref will give a 'any more and you're off' warning to someone, especially so early in the game. The second foul was very similar to Chico's foul on Barkley against Everton that led to a penalty, not a hugely dangerous area and just gets sucked in, it's the kind of situation where the risk associated with a mistimed challenge greatly outweighs the reward if the attempt is successful. It's a strange situation given his influence last season that pretty much everyone seemed to want Michu not to start this match, but until he's match fit the team is arguably better off with Pablo playing the attacking midfielder role and there are insufficient games left for him to play his way to fitness. I'm hoping his ankle didn't suddenly start feeling sore yesterday after the starting line-up was announced as the though of relying on N'Gog from the bench is a scary one (would have preferred Emnes/De Guzman to come on in that situation). 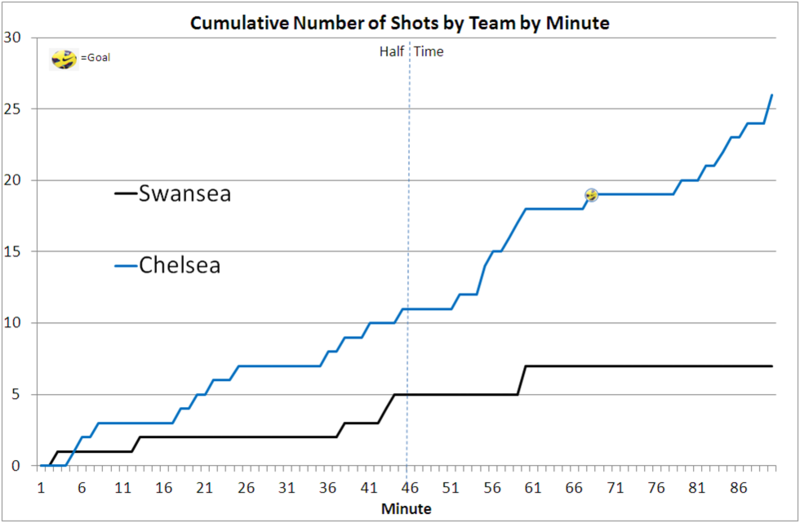 Shots by Minute: Post the sending off, Chelsea had 23 shots to Swansea's 5 with Swansea having only 2 efforts in the 2nd half (Routledge's shot and Bony's header from subsequent corner). 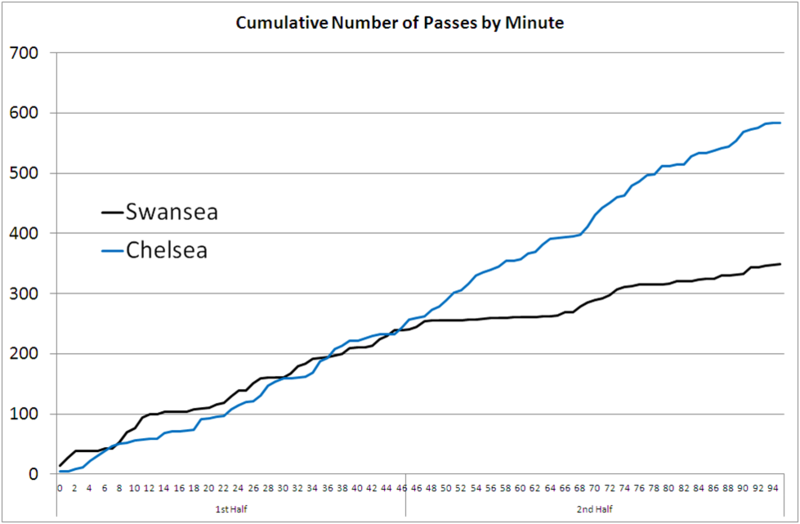 Possession wise it was even more one-sided, especially after the break and there was a 15 minute period just before the Chelsea goal where Swansea were under huge pressure and attempted only 6 passes. This makes it even more galling to concede from a situation with a throw from fairly deep in the Chelsea half. You can still get odds as big as 20/1 on Swansea going down (most bookies offering around 10/1) and there are 4 games left where there is a reasonable chance of getting points and with our goal difference 36/37 points would probably be enough, but going into the final game against Sunderland needing a result doesn't bear thinking about, not least because I'm starting to get images of Fabio Borini relegating us (thank God Ki won't be eligible to play as that'd be even worse). Positives from the game were Wayne Routledge's performance along with some great touches and backheels from Bony (i'm going to be a big Ivory Coast fan in the summer after lumping on him being Top Scorer at 500/1).